The National Christian College Athletic Association, which is more commonly referred to as the NCCAA, is a non-profit association that is focused on promoting and enhancing intercollegiate competition in athletics within Christian-centered institutions. The association believes there is a growing need for the promotion of athletics from a Christian perspective, in part because of the many questionable ethical decisions within the college athletics environment. To prevent the disappearance of morals within the intercollegiate athletic atmosphere, the association works with its member schools and sets standards that must be met to ensure that student-athletes have the best experience possible. 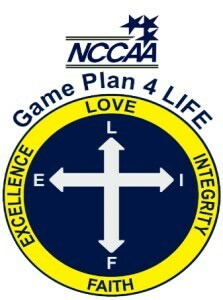 Instead of just focusing on winning the game or winning a division, the focus through the NCCAA is winning the “game of life”. This is why the association works to provide Christian athletes with the tools that they need to create a life plan while they compete and perform academically. Read on, and learn more about what the NCCAA does for member institutions. One of the many ways that the NCCAA is able to assist with the maintenance and the enhancement of athletic competition within the member institutions at both regional and national levels is by assisting college coaches with the programs and materials that they need. The NCCAA believes that providing leadership to and equipping coaches with the tools they need to encourage their athletes will aide in professional development while it aides in athletic development. Athletes often receive scholarships through the institutions that they represent. By excelling on the field or the court, and demonstrating their commitment to faith-based academics, athletes have most of their tuition costs covered. While many students get a free ride if they stay in good standing, the scholarship does not leave students with much money to cover living expenses. This is why it can really help improve an athletes quality of life by being awarded a NCCAA award. The association offers a long list of awards including: Game Plan 4 LIFE Character Award, Heart of Courage Award, Meritorious Service Award, Ministry Scholarship, Presidential Award, Scholar Team Award and Sports Ministries Award. Christian athletes dedicate their free time to service and you can find a variety of Christian service opportunities promoted through the NCCAA. From ministry opportunities, where you help others receive God, to service projects, where you volunteer to help the community, there are plenty of different ways that you can contribute your free time to make a difference in the world. If you would like to be both an athlete and a contributing member of society, who ministers the love of Christ to schools and communities, this is a great benefit. The entire purpose of the NCCAA is to produce great people and to acknowledge that competition is more than just about winning. The success of the students who participate in athletics at Christian institutions is more important than the success of the athletic programs. While promoting competition is important, the NCCAA is completely focused on the Christian perspective. This is why the National Christian College Athletic Association is so important in the process of developing the leaders of tomorrow.